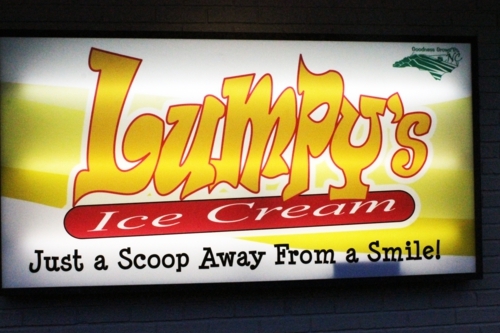 Lumpy’s is a new restaurant in Wake Forest offering ice cream and easy eats like hamburgers and frankfurters. Their grand opening is tomorrow from 11 to 7, but that’s just for the storefront. 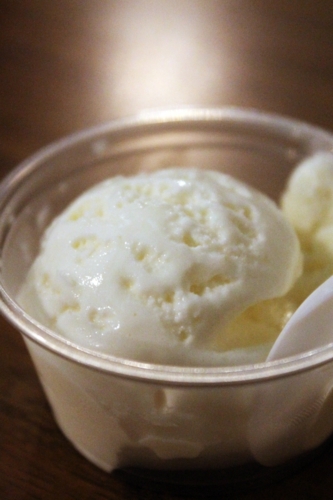 Lumpy’s owner and ice cream creator, Buck Buchanan, has been serving up his scoops since 2001 by cart at farmers’ markets, Highland games, and anywhere ice cream is welcomed. He studied ice cream making techniques for three years before going into the business. Buck and me. Yes, he’s that sort of guy. I suppose that makes me that sort of girl. 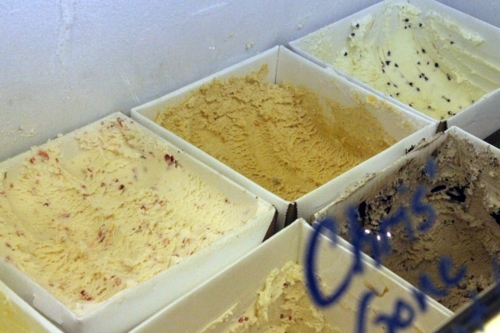 Over 200 flavors have come from his culinary mind, and the store offers 14 at any one time. To spread the word about the storefront opening, Lumpy’s put on a blogger preview night, inviting us out to try their wares. Who am I to say no to ice cream? We started by learning about the company providing the beef for Lumpy’s hamburgers and frankfurters—and yes, a big deal was made about calling them frankfurters and not hot dogs! That company is Harris-Robinette farms, and they raise all of their 4,000 heads of cattle on grass and also process the beef in NC. 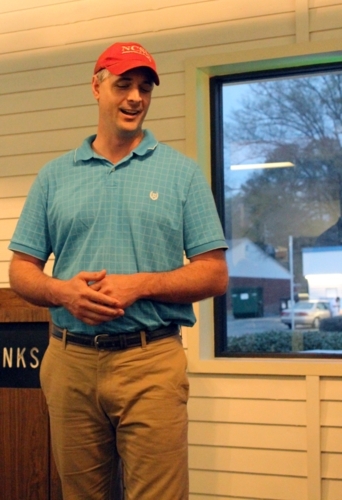 We learned all this from Patrick Robinette, who was deservingly proud of his operations. We also tried bites of the beef in forms of hamburgers and frankfurters. 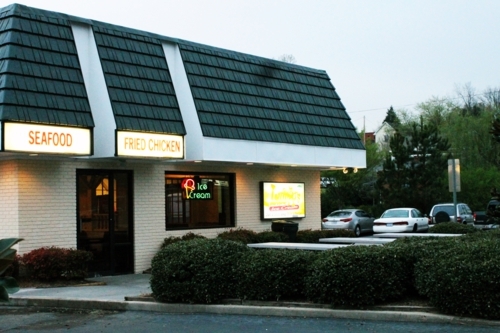 I definitely like the taste of grass-fed beef, and their burgers were no different than others I’ve had—they supply Duke’s cafeterias and SAS among other Triangle locations. The frankfurters, however, were the biggest stars of the meat offerings. They consist of 90% beef, 10% fat, and spices served up in natural casing, which is a much smaller amount of fat than hot dogs usually consist of. I could really taste the difference, and the frankfurter bites were delicious. But we were really there for ice cream, and we were spoiled with it. Buck led us through 8 flavors, and you bet you’ll get my thoughts on all of them. 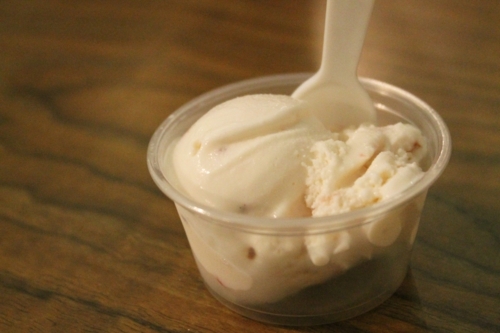 They are made with Maple View Farm cream, like many of the fresh ice creams in the area. 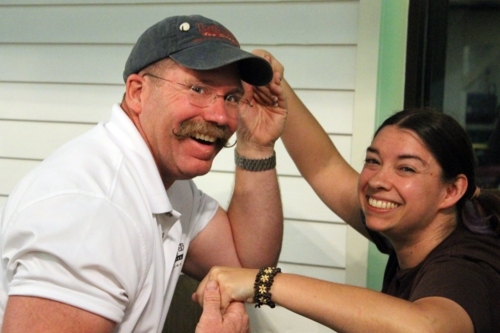 The scoops were all quick melters; Buck told us that he doesn’t freeze his ice cream as high as usual because the colder temperature can freeze taste buds, too, and you want to be able to taste everything the scoop can give you. I buy it. First up was the Bloggers’ Baklava, a flavor he whipped up in honor of our evening. It was one of my favorites, so I think the title fits. Another attendee asked if it were “made with real bloggers” and I’m not sure I want to know the answer—I know I’m attracted to my own kind already. Cinnamon, NC honey, and walnuts in a cream base made up the ice cream. 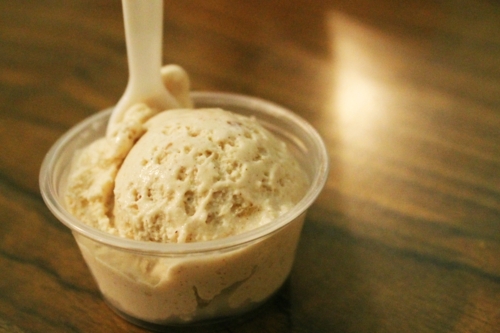 The cinnamon was strong and gave it texture that I love in ice cream. Next was mint chip. The mint extract is made fresh with herbs, no artificial flavorings, as are all Buck’s extracts that he can get locally. 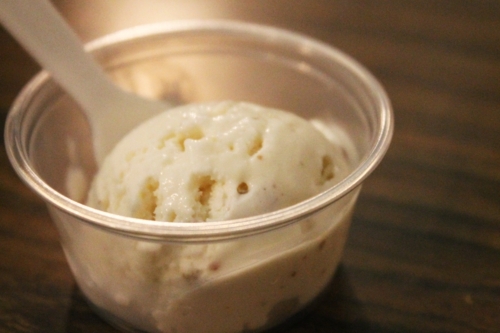 This one managed to have a lot of flavor, which some of the later ice creams didn’t do quite so well with. 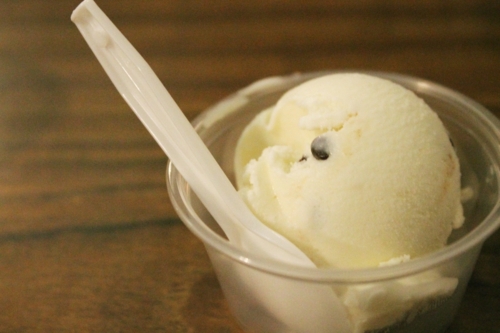 If you’re a mint chip fan and love fresh mint, then you should like it just fine. The third ice cream was my favorite of the evening: pumpkin pie. Normally, it’s a seasonal offering, but Buck received James River pumpkins recently and made a batch. There were strands of the squash in the scoop, and the spicing and flavor was spot on for me. It’s the sort of ice cream that would be dangerous for my waistline if I kept some at home. Sally’s Silly Strawberry was next. 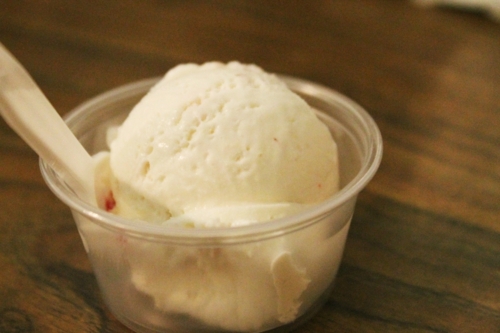 The strawberries are cut by hand right before adding them to the ice cream machine to preserve their shape and flavor. It has a very light pink coloring, which is normal when not using artificial coloring, and a good amount of small strawberry chunks. 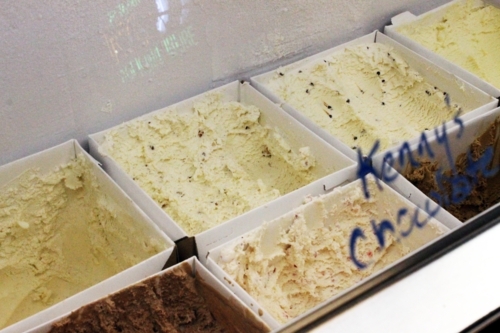 Kenny’s Kickin’ Chocolate was billed their most popular flavor. It’s made with melted down cocoa nips. I can find milk chocolate too plain a lot of the time, but the texture of this one was fun, with a few little tendrils that almost tasted like brownie batter, and the flavor was great. For his Highland games business, Buck created the Drunken Berry. Raspberries are soaked in 12-year-old scotch before being blended into the cream. The scotch flavor was very noticeable, and I enjoyed it though I don’t like just drinking scotch. If the raspberry bits were larger, I think I’d have enjoyed it a lot more, however. 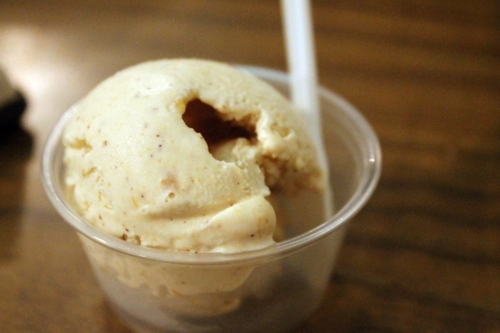 Bernie’s Butter Pecan is the only true butter pecan served in NC. Buck explained that he follows the official recipe for making it, which means using real butter and real pecans, melting brown sugar into the butter, and using no flavor base for the ice cream. I appreciate the dedication, but honestly, I wouldn’t mind the artificial flavoring for this one. Does that mean I need to turn in my food bloggers’ card? It was too mellow for me. Luckily, the second-to-last flavor was much more intriguing. Chris has Gone Coconuts is the name, and it was pretty good. I’m predisposed to love coconut, but even one among us who doesn’t enjoy coconut much liked this flavor. Again, I prefer more vibrancy, which might have been achieved by using fresh coconut rather than flaked coconut, but Buck discussed how that just isn’t a production possibility because the process would be too intensive. Perhaps adding a spice into the blend would make it pop more. 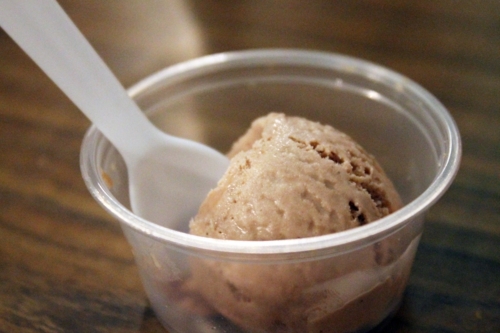 Finally, my second favorite flavor of the night, and our last one, was served: Coffee Cinnamon. Again, I love cinnamon ice cream, and this had the ideal amount of it for me, right on the edge of too much. 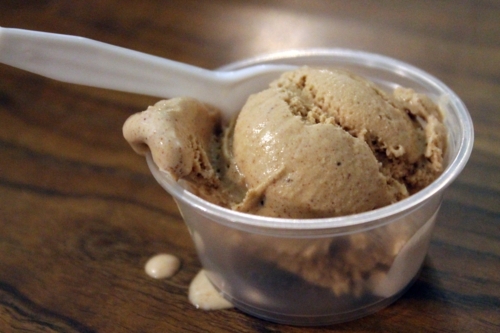 The coffee flavor comes from drip coffee brewed to a syrupy texture, and it was perfect—not too bitter, not too light. I think coffee ice cream fans will be happy with this one. 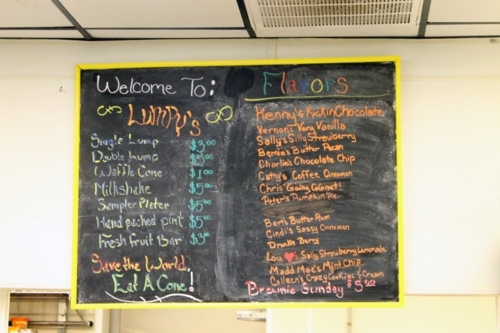 While serving that last flavor, Buck mentioned that Lumpy’s will offer coffee for free for their customers, but you have to buy a scoop to use for your sugar and cream. Stroke of genius, I say. If any of those flavors intrigue you and you’re in the mood for a lovely drive to Wake Forest, stop by their grand opening tomorrow! Like I said, it’s from 11 to 7, and they will have a special bourbon bacon flavor on hand as well as prizes and souvenirs. The NC Railhawks, Commissioner Troxler, and the Got to Be NC big cart will all be there. Thanks to Buck and Kevin and their families for having us out! This blogger was well fed with ice cream, and she can’t wait until the pumpkin pie flavor comes around next fall. Nice write up. Wish I had made it to the event. Thanks, Ben. It was fun! Plus, it was awesome seeing Cranky Diners again and meeting EatRaleigh, TriangleExplorer, and theLushers. Meeting food bloggers is always fun! There is no way I could safely keep the pumpkin pie ice cream at home! I agree, the spice flavors were the best of the night!